We look forward to helping you get started. It's really easy, actually. And you've got a couple of different options. Attend the free class this Saturday morning at 9:30 am. Schedule a free one-on-one introductory session. For those with CrossFit experience, the introductory session involves completing a “scouting report” that includes athletes’ partial fitness histories, goals, strengths, and “goats.” Our coaches use these reports in order to provide personally tailored instruction in classes. We’ll also describe our philosophy and certain training methodologies as well as show you around the place. 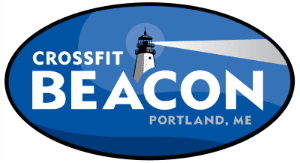 For those new to CrossFit, the session includes a tour, description of our philosophy, coach demonstrations of a few basic CrossFit movements, and opportunities to try them out yourself. We offer our Foundations classes in an one-on-one individual format. Individual Foundations is scheduled directly with a coach. That’s it! You’re on your way to becoming part of the Beacon community, what we call IllumiNation! Still have questions? Feel free to contact us electronically or by calling 207.619.2322.